FISHERS, Ind. 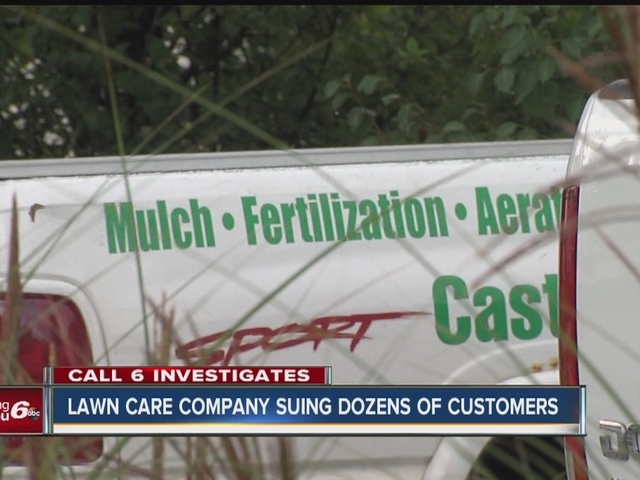 -- A Fishers lawn care company has filed dozens of lawsuits against its former customers, accusing them of failing to pay their bills. Castleton Lawn Care of Fishers has filed 69 lawsuits against former clients since August 30 in Marion, Hancock and Hamilton counties. However, many of those customers told Call 6 Investigates they do not owe any money, and that the company was plagued with poor service and billing problems including missing invoices and bills for services the customers say they never received. Ten customers appeared in Lawrence Township Small Claims Court Wednesday to face accusations they owe the company money. Lisa Shelton is being sued for $1,090 for services rendered and attorney’s fees. Shelton said the lawn care service was poor, so she canceled in summer 2015, but still continued to receive bills. Phuc Tien is being sued for $641 for services rendered and attorney’s fees. Tien said he complained after the company failed to cut patches of his lawn and damaged his siding. Tien said he was surprised to be served with a lawsuit a year after he ended his relationship with the company. Castleton Lawn Care’s website advertises fertilizer service, however, the company has never had a license. Reed said violators can face a fine of up to $1,000 a day for applying fertilizer without a license. Call 6 Investigates stopped by the Olio Road address listed on the company’s website, but could not find Castleton Lawn Care. No one answered when Call 6 Investigates called the number on the website Wednesday. Call 6 Investigates went to the Fishers home address listed on the lawsuits, and found several Castleton Lawn Care trucks, some equipment and a yard full of weeds. No one answered the door when Call 6 Investigates stopped by. Call 6 Investigates sent an email to the company and their attorney Mark Metzger asking for an interview and a copy of their fertilizer license, but we did not hear back. Metzger declined to comment after court Wednesday afternoon, as well as the company’s owner Daniel Ciesniewski. Although some customers decided to pay the money they’re alleged to owe, most of the homeowners plan to fight back in trial. The Lawrence Township Small Claims Court judge set trial dates for those customers, most of them in December, in which the company and client will have an opportunity to provide evidence and witness testimony. Many of the customers sued in Hamilton and Hancock counties are expected to appear in court later this fall. The company’s contract says the client must provide a 30 day notice to cancel service, as long as it’s been a month since they signed the agreement.